Northamptonshire Police operates National Speed Awareness courses for speeding offences. Helped them achieve smooth operations and deliver an enhanced customer experience. When they came to us, courses were managed by five administrators. Training was booked via telephone and paper forms. Payments were made by cheque, postal order and over the phone. More than 2,000 courses are booked each month, and all these bookings were recorded in A4 diaries, with information duplicated in spreadsheets. What they required was a complete training management platform that could save time and automate core processes. One that, crucially, was flexible enough to allow full integration with the Force’s bespoke National Driver Offender Retraining System. Choosing our training management system enabled Northamptonshire Police to speed up course processing. With added value modules, the Force was also able to offer 24/7 online course booking, accept a wider range of payment methods and data-driven reports for greater insight. 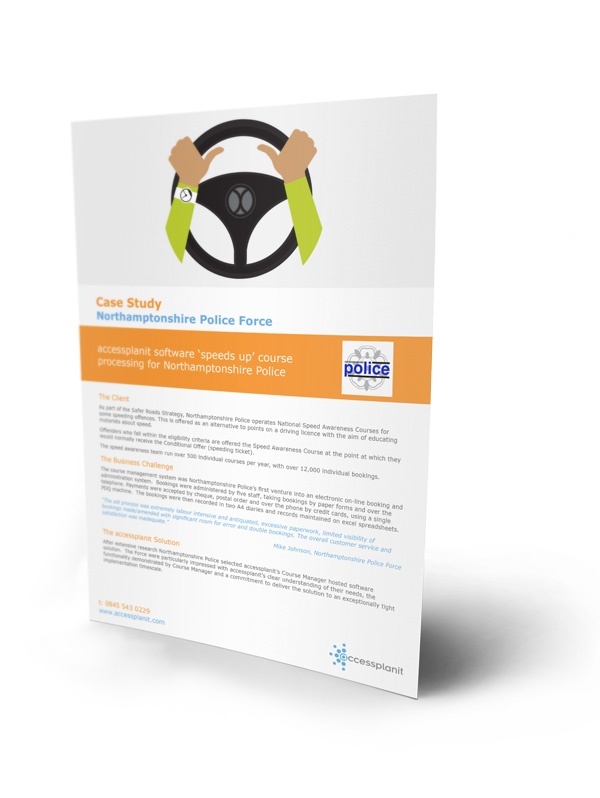 Get your free case study today, and explore how we saved Northamptonshire Police 70% in admin costs.